Cox's Bazar - Sitting on the cold, dusty floor of a ramshackle tent in Kutupalong - one of Bangladesh's largest Rohingya refugee camps - Rajuma struggles to contain her grief as she describes the night her baby son was brutally murdered. With pain etched on her face, she recounts in detail the day Myanmar's army attacked Tula Tuli, her isolated village in northern Rakhine state. "My baby was in my lap when the soldiers hit me," she says, her voice cracking with emotion as tears begin rolling down her cheeks. "He fell out of my arms. Then they pulled me closer to the wall, and I could hear that he was crying. Then after a few minutes, I could hear that they were hitting him too." 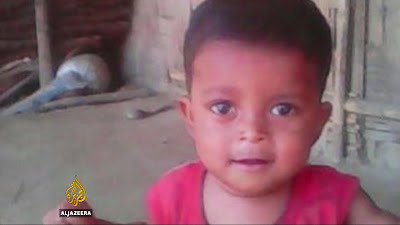 Sadiq was a happy, playful one-and-a-half-year-old baby boy - a child Rajuma still cannot believe is gone. After ripping him out of her arms, Rajuma says Myanmar soldiers hurled Sadiq into a fire. She was then dragged into a house and gang raped. "I feel like I'm burning on the inside," Rajuma says, before breaking down and crying out for her dead mother. Her parents, two of her sisters and her younger brother were also killed. Her husband, Rafiq, was the only other family member to survive. Several Rohingya have shared similar accounts, describing how women and girls were raped, tortured and forced to endure acts of humiliation at the hands of Myanmar soldiers. Myanmar has denied allegations of ethnic cleansing, saying the military offensive was a "clearance operation" to flush out Rohingya fighters who had staged attacks on border posts in August. It has also refused to allow international observers to investigate. Since August 25, the Myanmar army has waged a brutal military campaign in northern Rakhine state against the Rohingya - a Muslim-majority ethnic group to whom the Myanmar government has denied citizenship and basic rights. Nearly 500,000 Rohingya have fled Myanmar, most arriving in Bangladesh by foot or by boat, with aid agencies struggling to cope with the influx. Support for mental health and psychological care is in short supply, raising fears that the Rohingya could be left with life-long mental - and even physical - damage. "Sometimes [Rajuma] says her head feels like it's twisting and that she can't tolerate it," Rafiq tells Al Jazeera. "Sometimes she looks at the photos of our baby, and she screams and cries. "Every single day she cries."